The Board of Governors of the Federal Reserve System recently issued their annual report to the Congress on the Presidential $1 Coin Program (pdf link). This report is required under the Presidential $1 Coin Act of 2005, which created the series of golden colored $1 coins featuring the likenesses of the former Presidents. The Presidential $1 Coin Program began in 2007 and has featured the portraits of four different Presidents per year. The series will continue until each former President who has been deceased for at least two years has been so honored. By law, the Federal Reserve Banks are required to ensure that unmixed quantities of each newly released design are available to financial institutions during an introductory period. In order to comply with this requirement, Federal Reserve Banks created a special ordering period surrounding the public release dates for each coin, during which financial institutions may place orders. While the ordering window has kept the Federal Reserve Banks in compliance with the law, it has resulted in a growing stockpile of $1 coins that are either not ordered or eventually redeposited by financial institutions. 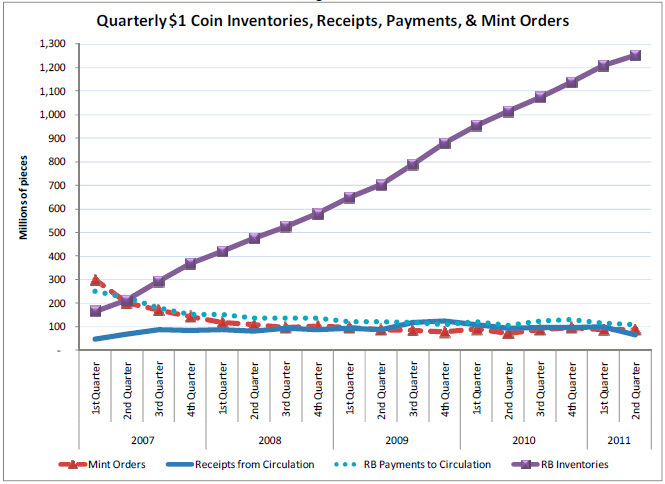 According to the report, 40% of all $1 coins ordered through the Reserve Banks system are eventually redeposited. 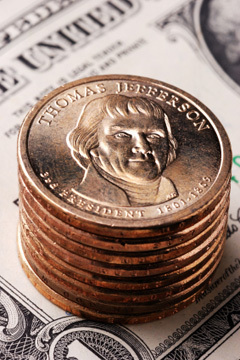 Industry representatives cited in the report indicate that the coins are easy to order, but “transactional demand for $1 coins has not increased since the start of the program and that overall demand continues to come primarily from collectors.” Some of the Reserve Banks largest cash customers are considering whether they will continue to provide Presidential $1 Coins to their customers. Another contributor to the Federal Reserve Banks growing hoard are the $1 coins initially ordered through the United States Mint’s Direct Ship Program. The report estimates that 60% of these coins are eventually redeposited. Many of the coins distributed through the Direct Ship Program are from the separate Native American $1 Coin Program. These coins are legislatively required to represent at least 20% of all annual $1 coin production; however, unlike the Presidential $1 coins, there is no legislative requirement for the Reserve Banks to offer the coins during an introductory period. As a result, the Reserve Banks have not ordered the coins from the US Mint, although the US Mint is still required to produce them. As of May 31, 2011, the number of $1 coins held by Federal Reserve Banks has grown to 1.252 billion. Based on current trends, it is expected that the total inventory may grow to more than $2 billion by the end of the program. The report concludes with two recommendations for legislative action, which would address the issue of the Federal Reserve Banks growing $1 coin hoard. Support is offered from a legislative proposal from the United States Mint to eliminate the 20% requirement for the Native American $1 coins. This requirement currently compels the United States Mint to strike unnecessarily large quantities of the coins despite the lack of transactional demand. The second recommendation is to eliminate the requirement for an introductory period for the Presidential $1 coins. This requirement currently compels the Reserve Banks to continue ordering each new design of the series from the United States Mint despite already having “ample inventories” of $1 coins. It is time to discontinue the dollar bill. Yes, it’s time to stop printing the dollar bill. That is my recommendation for legislative action, which would address the issue of the Federal Reserve Banks growing $1 coin hoard. Congress needs to act. It is madness to pay money to store the coins, and even greater madness to keep making so many of them. Cut the mintages way back so collectors will be happy, and the Mint saves money. And as others noted, get rid of dollar bills too. Today’s quarter has the purchasing power of the 1964 penny. We revamp out entire coinage. We should have Quarter, $1, $5, $10, $20, and $50 coins. We should have $100, $500, and $1000 bills. The Quarter, $1, and $5 coins should be bronze and the $10, $20, and $50 coins should be 40% silver. None of these coins should be a size that would be awkward to carry. The $50 coin should be no larger than today’s half dollar. Counterfeiting would be the biggest problem. Passive RFIDs should be embedded in the coins for easy verification. Perhaps there’s something similar that can be done with the bills. No! It is not time to stop printing the dollar bill. Why stop printing something the people clearly prefer and continue minting something they do not want? The overabundance of dollar coins was 100% predictable. The people never wanted them and this is just another example of govt refusing to listen to the people. During my short 45 years on Earth the American public has not wanted Eisenhower, Susan B. Anthony, Presidential, or Sacajawea dollar coins. Change or eliminate the legislation for these coins. I just wish we could eliminate Federal Reserve Notes and replace them with United States of America Dollar notes the supply of which is controlled by the people. I completely agree with IndenturedServent’s post above…except for the Eisenhower dollar. There’s something about a coin with heft, even if it is only clad. it’s time to discontinue the one dollar bills and one dollar coins. and produce a smaller size dollar like that of a current quarter. and change the size of quarter to a smaller too..
change the composition of nickel and cent to steel plated copper. like that of canada. issue more five dollars bills and continue to issue all those discontinue bills and coins for collectors. of course a fair mited mintage. Did the feds melt all the Eisenhower dollars in the vaults or are they still in the vaults? ?